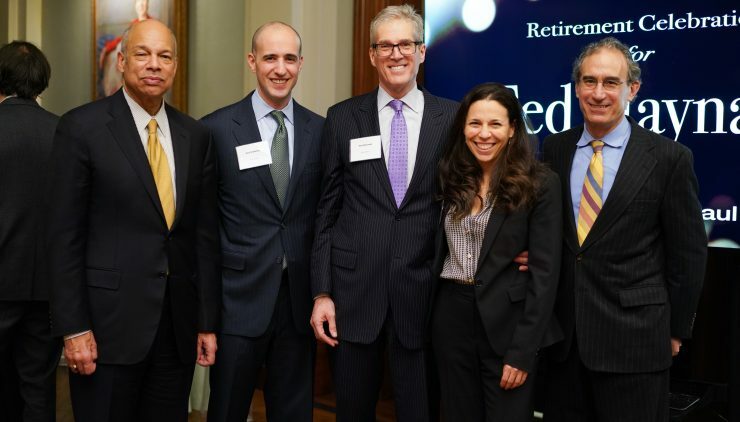 Paul, Weiss and the Vance Center celebrated Ted Maynard’s retirement as firm partner and appointment as the Vance Center Committee’s executive chair, at a reception at the New York City Bar Association. Maynard is a founding member of the Committee and has served as its chair, but on his retirement plans to devote much of his time to the Vance Center’s work and management. Remarks at the event focused on Maynard’s practice and popularity at the firm, as well as his many contributions to the Vance Center. Paul Weiss partner and pro bono committee co-chair Neil Goldman, speaking for firm chairman Brad Karp, away on business, recounted starting his firm career with Maynard interviewing him at law school. Event moderator and Vance Center Executive Director Alexander Papachristou read remarks of Vance Center Executive Sub-Committee member and Shearman & Sterling partner Antonia Stolper, absent for illness, extolling Maynard’s leadership and participation in the Vance Center. Jeh Johnson, former U.S. Secretary of Homeland Security and U.S. Defense Department and U.S. Air Force General Counsel and Paul Weiss management committee member, cited the Vance Center’s namesake former U.S. Secretary of State and New York City Bar Association President Cyrus R. Vance as a role model for his rotation of government service and private practice. He also recalled becoming partner at the same time as Maynard and enjoying his collegiality. Former U.S. Attorney General Loretta Lynch, also former Vance Center Committee member, spoke by video of Maynard’s contributions to the Vance Center’s long-time work in sub-Saharan Africa, including speaking at a conference held in conjunction with the inaugural convening of the African Court of Human and People’s Rights and leading the development of the African Legal Fellows Program. Paul Weiss partner and pro bono committee co-chair and New York City Bar Fund board member Audra Soloway described Maynard’s various pro bono engagements at the firm, as well as the firm’s recent participation in Vance Center pro bono projects related to children’s rights, investigative journalism, and redressing large-scale corruption. Maynard spoke gratefully to the audience of approximately 70 firm partners and associates, Vance Center Committee colleagues and staff, and New York City Bar Association members and staff, including Executive Director Bret Parker. He continues at the firm as Of Counsel and soon after the event traveled to Santiago, Chile, to open the annual conference of the Pro Bono Network of the Americas which the Vance Center co-coordinates.